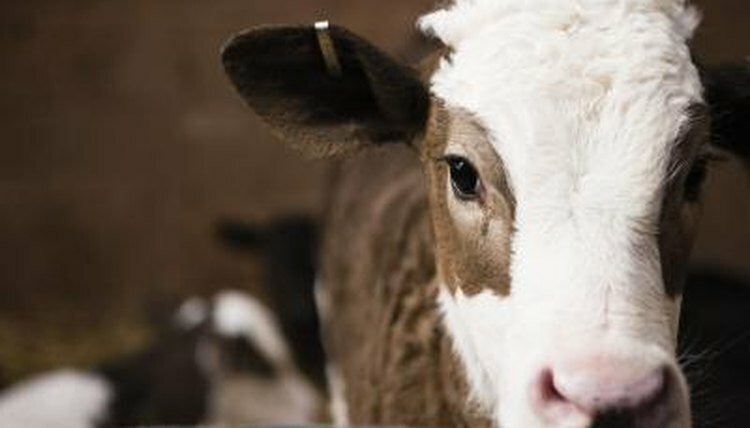 Bovine gestation lasts approximately nine months, just like human pregnancy. Calculating a cow's due date might be more accurate than figuring a woman's, since farmers generally know exactly when their animals were bred. For cows, the calving date should be 283 days after insemination. Count ahead 283 days from insemination date, or just under 9 /1/2 months. Then figure in a couple weeks' leeway in either direction. If your cow was artificially inseminated or exposed to a bull on January 1, she would likely calve around October 10. Small cattle breeds and heifers expecting a first calf usually give birth earlier, while larger breeds and older cows might deliver a bit later. Ten days to two weeks in either direction is considered normal. If your cow doesn't show signs of calving at two weeks past her due date, contact your veterinarian. Once you've figured out your cow's due date, start watching her carefully for signs of imminent calving at least two weeks beforehand. While a filling udder is a good sign that calving is in the works, it can occur several days before a calf actually arrives and months before in the first-time mother. If your pregnant cow stops eating and separates herself from the herd, she's getting ready to give birth. You'll notice relaxation of her pelvic ligaments in preparation for the impending delivery.